A fall wedding cake is the delicious ending to the amazing Fall wedding that you are planning. As the weather gets cooler and leaves begin to change, there isn't a better season for a wedding. Brides today have many options when choosing a cake. Typical, traditional white cake with white icing is still popular, however many couples are getting creative with their wedding cakes. Why be typical and boring, especially when you are getting married in such a great season? Your wedding is your chance to express your creativity and do things the way you want to do them, so go ahead and think outside the wedding box a little! 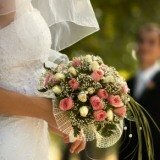 Unique shapes and sizes along with specialty flavors have become a popular wedding planning trend, and the Fall season offers many unique options to choose from. To see photos of fall cakes visit fall autumn wedding cake. Accent your cake with seasonal items like leaves and other flowers. Sunflowers, mums and hydrangea are great examples of Fall wedding flowers that can be used as decorations on your cake as well as on your cake table. While you may not want to use real leaves, real flowers can definitely be used as decorations. Try just using the heads of sunflowers, mums or roses. Silk flowers are another alternative. Fondant is a sugary paste that can be molded into just about any shape, like leaves, pumpkins or any other Fall item. It is also great for unique cake shapes and designs. Leaves are a popular item to have done in fondant. A good cake designer will be able to create leaves that match the colors of the Fall foliage outside. Accent your cake with other Fall dessert favorites. Things like leaf or pumpkin-shaped cookies, apple tarts, and even mini pumpkin or pecan pies can be displayed on a dessert table to accompany your cake. Leaf cookies can also be used as your wedding favors. Unique cake flavors and types are a fun alternative to traditional white cake. Fall flavors such as spice, pumpkin or even red velvet can add a unique twist to your wedding reception. Match your cake to your wedding theme. 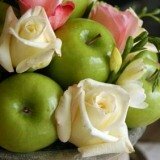 Theme ideas include wine, apple, pear, Halloween and Fall flowers. Add a Fall cake topper. Have it match your wedding theme or anything Fall related to tie it into the season.